If your baby is born in the hospital, chances are she will be swaddled when she is given to you. Hospital nurses are masters of swaddling newborns. 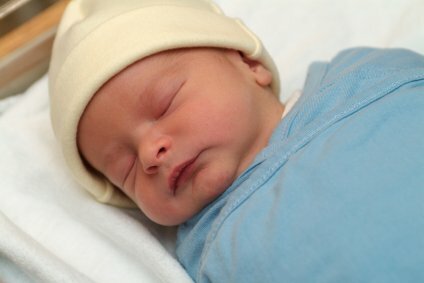 The reason behind the nearly universal use of swaddling in hospitals is the belief that babies sleep better and cry less when they are swaddled. Those adorable, jerky newborn motions interrupt sleep, leading to tears. 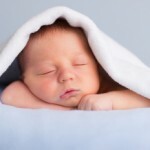 Babies sleep longer: Babies are used to being snuggled tight in the womb. 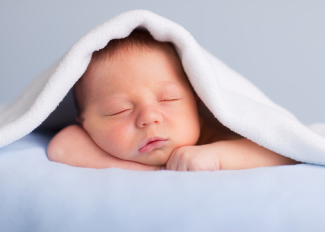 While being wrapped tightly in a blanket doesn’t sound great to most adults, it is for a new baby. Hospital nurses, friends and your mother will all tell you that babies do sleep better when they are wrapped. Less crying: The movements of his arms and legs cause the baby to startle. This is upsetting to the baby and causes over stimulation. 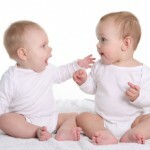 When they are over stimulated, newborns cry in an attempt to block out the stimuli. When they are swaddled, the jerky arm and leg movements are kept to a minimum, resulting in less crying. Fewer scratches: Newborn nails are sharp and grow fast. Nearly all babies scratch their faces with those jerky movements in their sleep. When the baby is swaddled, she is less likely to scratch up her face the night before you have her portraits taken. Spread a receiving blanket flat on the bed or other flat surface. Fold one corner of the blanket over a few inches. Lay the baby with her head on the corner of the blanket you just folded. Wrap the left corner over his arm and body and tuck it under the other side of his body. Take the bottom corner and bring it up over his feet. Take the right corner and wrap it around his body and bring it around to the back. Only the baby’s head and neck should be exposed when you are finished. There have actually been studies that back up the traditional wisdom of swaddling babies. A 2002 study at Washington University found that swaddled babies slept better and longer compared with babies who were not swaddled. While many people stop swaddling when the baby is a few months old, researchers at Washington University suggest the practice has benefits beyond the newborn stage. Other studies suggest swaddling may not always be a good thing. Studies conducted in Turkey and China found a higher incidence of pneumonia in swaddled babies. According to the study, babies who were swaddled for three months were four times more likely to develop pneumonia. The researchers suggest that the combination of swaddling and leaving the baby on her back may be interfering with respiratory function. This is the only study done to date and further research is needed in this area. The amount of time a baby is swaddled may be an important part of the equation. Earlier studies suggested a link between extensive swaddling and problems with the hip joints. Since hip joints are still developing in the newborn period, this would make sense. Using swaddling at nap times and bed time to help encourage sleep and leaving the baby unswaddled at other times would allow you to gain the benefits while avoiding any risks.